More than 714,000 Midwesterners now work in clean energy industries across the Midwest according to a new analysis of energy jobs data from Clean Energy Trust (CET) and the national, nonpartisan business group E2 (Environmental Entrepreneurs). The region’s clean energy economy now employs more than all the waiters and waitresses, computer programmers, lawyers and web developers in the Midwest combined, according to Department of Labor Employment Statistics. The report follows E2’s Clean Jobs America analysis which found the clean energy jobs account for nearly 3.2 million jobs across all 50 states and the District of Columbia. Both reports expand on the 2018 U.S. Energy and Employment Report (USEER) released in May by former Energy Secretary Ernest Moniz’s Energy Futures Initiative (EFI) and the National Association of State Energy Officials (NASEO). CET and E2 were partners on the USEER. Read more here. 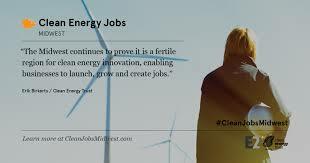 This entry was posted in Nebraska / Midwest News, Research and tagged American clean energy jobs, Clean Energy Trust, E2's Clean Jobs America, Environmental Entrepreneurs, Midwest clean energy jobs, Nebraskans for Solar NewsBlog, Solar Power World on August 8, 2018 by Helen Deffenbacher.